Thanksgiving is over and it was a good one for Quinnipiac fans. They swept Maine over the weekend paying them back for the Black Bears sweeping the Bobcats a season ago in Hamden. The team moves to 11-2 on the season and is ranked #9 in the USCHO and USA Hockey polls. They are also ranked 7th in the important pairwise rankings. There was some future Bobcats in action even with the holiday break so lets see how some of them did over the past week. Jayden Lee picked up two more assists this past week for the Powell River Kings. On the season he now has 17 points (1 goal, 16 assists) in 26 games played. PJ Fletcher picked up a goal in two games played for the Wenatchee Wild. On the season, Fletcher has 11 points (3 goals, 8 assists) in 28 games played with his production really picking up since the middle of October. Logan Britt had a strong week with a goal and two assists in three games played for the Lincoln Stars over the past week. In 18 games played, Britt has 11 points (3 goals, 8 assists). Expect a Q&A with Britt to be posted on Wednesday. Justin Robbins is on a hot streak. He has won his last four games for the Chicago Steel and was strong in two wins over the weekend making 37 of 40 saves in the two games. He is 8-5-1-0 on the season with 3.42 goals against and an .880 save percentage in 15 games played. Evan Fear had one good game and a game that he gave up six goals in. Last Wednesday against Central Illinois he gave up six goals on just 22 shots before being pulled in the third period. 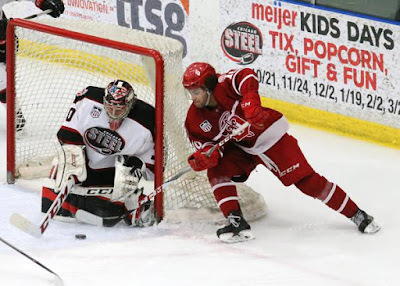 Saturday was a much better outing when he made 37 saves in a 6-3 win over Muskegon. On the season he is 6-4-2-0 with a 3.21 goals against and a .908 save percentage. He has one shutout. Jack Silich had a goal and four assists in five games in a tournament this weekend for the Chicago Mission U-15 team as they ended up losing to the Don Mills Flyers in the semifinals. On the season he has 61 points (24 goals, 37 assists) in 43 games played. Liam McLinskey started play for the Don Bosco Prep hockey team. This past weekend he had two assists in two games as Don Bosco won both of them. He is coming off a 21 point junior season.